The book removes the abstraction from this syllogism by focusing on a case that was in popular culture a lot around the late 2000s, a few years after the book’s initial 2013 publication: the dog fighting scandal surrounding Michael Vick. True, the case may seem a bit dated in 2017 (or in future years), and reference to the case is peppered liberally throughout the whole book (the last name “Vick” appears 66 times over the course of this short text). Despite these reservations, I recognize this as an effective choice. Perhaps no case of animal rights abuse was ever as high-profile and universally condemned. There was so much opprobrium directed at Vick, even by formerly devout fans. Rightly so, as most people recognize that inflicting unnecessary suffering on animals is wrong. But this case starkly highlights the hypocrisy of the omnivorous public. Why get so worked up about animal cruelty in dog fighting, while thinking nothing of what happened to the cow, pig, chicken or fish on your plate? Surely, animal agriculture is a significantly greater driver of suffering than dog fighting has ever been. 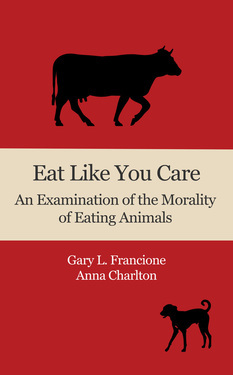 After laying out a strong opening exposition, befitting of the authors’ backgrounds as legal scholars, they offer the reader three choices: shut the book and adopt a vegan diet now, conclude that you don’t object to animal suffering, or contend that there must be some hole in the book’s argument. People in this last camp, presenting what Francione and Charlton call the “but” arguments, are the focus of the second section, which makes up the majority of text. This section is in a Q&A format, in which the authors systematically knock down all of the common objections omnivores employ in defense of meat and dairy. Offering readers a choice of whether to read this section, or to skip around to your specific objection, is wise. The second half of the book grows tiresome to converted vegans, who will roll their eyes at the sloppy reasoning, long-discredited myths, and lazy misdirections. Many vegans will recognize these lines of inquiry, compounding the annoyance. This willingness to take on all comers is actually a virtue of the book, as it clearly is not intended to preach to the choir. Some concerns, such as those surrounding the healthfulness of veganism or practical concerns, are perfectly legitimate for those new to the cause. Still others are transparently defense mechanisms, designed to avoid reckoning with the topic at hand. People know that appeals to tradition, pleasure or the possible sentience of salad are not good arguments. They only cling to them because they don’t want to acknowledge that their dietary habits may be unethical. Francione and Charlton provide model advocacy in such circumstances. They are patient and gentle, eager to meet people wherever they are. For instance, in addressing the religious concern that God gave man dominion over animals in the Old Testament, they actually use scripture to make a plausible reading for veganism. They do not mount a rigorous defense of the biblical case for veganism, rather they show that the bible can be used to justify either behavior. It contains no ringing endorsement for any dietary plan. Many vegans confronted with this argument would simply say that biblical fundamentalism is wrong, or that the Old Testament is not a particularly good guide to morality in many areas. These may be, in my mind, perfectly good rebuttals, but Francione and Charlton are always empathic and conscious of their audience. Although the authors are careful not to alienate people, they maintain firm principles. They insist that half-measures are not enough. A vegan diet is an attainable goal and reducetarianism, welfarism or even vegetarianism, are not prescriptions they cannot abide. According to Francione and Charlton, if readers insist on gradually adopting a vegan diet, which is usually the case in my experience, they ought to go step-wise through each meal. Go vegan for breakfast first, then add lunch, then dinner, then snacks. This method of transition has the benefit of keeping people focused on the end goal of veganism. The concern with reducetarianism or vegetarianism is that these may be seen as ends in themselves. Since the authors draw no moral distinction between meat and dairy, this makes sense. The more traditional route that I went through was by adopting vegetarianism, then switching to veganism. It’s unclear to me that appeals to reducetarianism or vegetarianism with an end goal of veganism in mind are necessarily less effective, but exactly which route makes for better advocacy is a long-standing debate within the vegan community. There is some merit to each side of the argument and I admire the directness of the advocacy approach adopted by Francione and Charlton here. By the conclusion of this short, simple book an omnivore’s life should be changed—a veil lifted. Anyone who knows the argument against meat and diary consumption from an animal suffering perspective can no longer plead ignorance, as most omnivores do. They must face their dietary choices with a new light streaming into their consciousness. This is the goal of the vegan movement. Next Episode 2: What is Veganism?